:Full of entertaining stories and real-life illustrations, this classic book will give you the strategies you need to become proficient in the art of effective persuasion, including how to project warmth and integrity, increase productivity, overcome objections, and deal respectfully with challenging prospects. This new edition includes fresh opening and closing chapters as well as tips and examples throughout that illustrate the relevance of these truths in the marketplace today. Also includes a foreword written by Tom Ziglar. 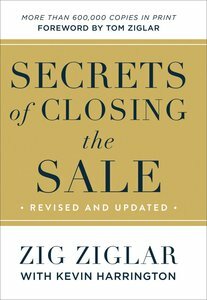 About "Secrets of Closing the Sale"